This whimsical bracelet from Daniel Jocz’s Candy Wear series reminds us that one of the most important aspects of jewelry is the joy it brings to both the wearer and observer. 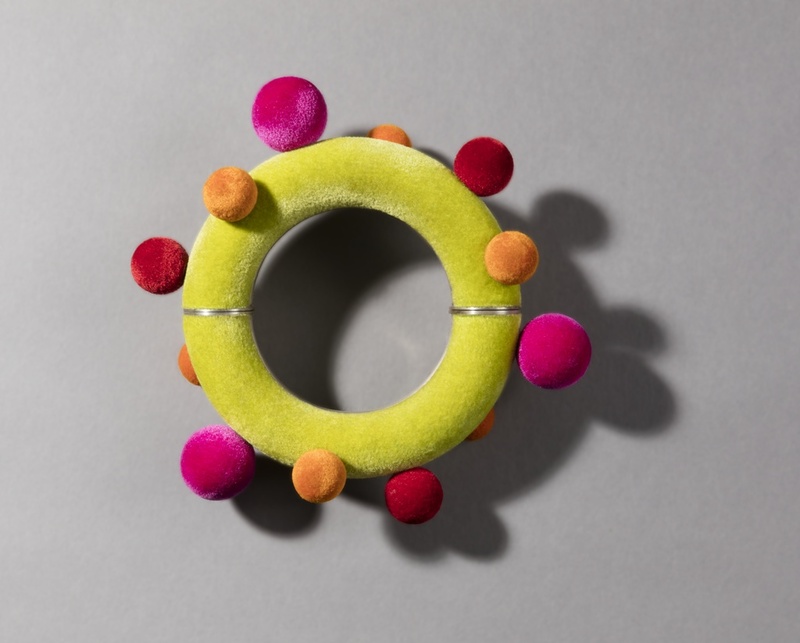 The bracelet’s bold form conveys a sense of fun, through its simple shapes and neon-colored flocking, an unconventional material for jewelry, that lends a soft fuzzy texture in place of smooth hard metal. Inspired by the art of pop culture, this bracelet bursts with colors, shapes, and texture, daring the viewer to take in all that it has to offer. Jocz has taken an unassuming circle and embellished it with eye-catching orbs of bright pink, red and orange scattered on a ground of neon green. To extend beyond the impact of color, Jocz chose to vary the size of the orbs, creating both visual and tangible interest. The interplay of these colorful balls encourages the viewer to touch them. Jocz’s creative use of flocking—adding the soft material to the bracelet’s metal surfaces—has made the hard form still more attractive to touch. Such sensual appeal prompts the observer to wonder what it would be like on the wrist. Would it be heavy? Cold or warm? Is it awkward or comfortable? The texture of the flocking is an integral design element of Jocz’s Candy Wear series, and he has become a master of the flocking technique. To achieve the fuzzy surface, rayon flecks are electrically charged and put into a flocking “gun.” An electronic wire is then connected to send a charge to a stand (covered in conductive paint) holding a silver ball or other jewelry component. The “gun” is turned on, aimed, and swiveled as the rayon flies through the air, attaching itself to the component. Jocz created his Candy Wear series to look like pieces of candy, calling to mind brightly colored spheres of bubble gum and sour balls. His motivation was to compare the fleeting sweetness of melting candy with the temporary allure of popular fashion. As candy is relished at the moment it is eaten, fashion too, should be enjoyed in the moment. This bracelet is on view in Jewelry of Ideas: Gifts from the Susan Grant Lewin Collection, through May 28, 2018.